Five times more durable than leading market competition. Moisture, sweat and body oils can all contribute to hearing aid breakdown and failure. How is P2i nano-coating technology applied? 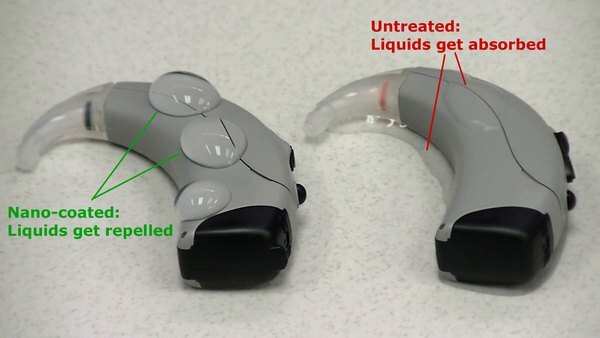 The nano-coating is applied using a special pulsed ionized gas (plasma), the process bonds a nanoscopic polymer layer -- one thousand times thinner than a human hair -- to the hearing aid. This durable ultrathin fluoropolymer coating is applied to all internal and external components. How does it work and help? This high-tech coating system ensures that the sensitive electronic components are protected thus providing optimal durability and performance. P2i nano-coating dramatically lowers the product's liquid surface friction, so when humidity or sweat come into contact with a device, beads form and simply roll off. Visit our YouTube channel for video demos: www.youtube.com/audinausa.